As noted over the last few months, the subscription price for all new accounts is increasing to $19.95/year on September 15th, 2014. Existing subscriptions are unaffected by this increase, but will get access to the new features we have planned. Patchtrends.com doesn't currently have tiered subscriptions or differentiate users. It is doubtful we ever will. After this price increase, there are no plans to increase the price of a subscription for at least 1 full year. The increase in price also reflects work that's been happening behind the scenes to offer new features. As briefly mentioned in the previous post, several are currently in the works. One of them will be discussed further below. We actually maintain two databases. We track all completed auctions under the "Boy Scout" category in "Historical Memorabilia," but we also track most active auctions and store items that are currently for sale. Patchtrends.com provides the searching interface to the ever growing collection of completed auctions (nearly 3.5 million at the present). The new Email Alert feature for Patchtrends.com members will provide an automated way to be alerted for new items that get added to the completed auctions database, the active auctions database, or both. Emails will be sent as both HTML and text-only. Both formats will contain search results, including a section on statistics computed over the entire database for that search query. The HTML version will also contain images links and item links for your convenience. The idea here is to allow members a more convenient and tailored way to track active auctions, but to also be alerted when an interesting item is recorded in the completed auctions database. This feature is currently in testing and is scheduled to be released for member use by the end of September. If you are interested in becoming a tester for this feature, please contact patchtrends@gmail.com. You must be a member of Patchtrends.com to participate. There are also a couple of other features in the works that future blog posts will discuss. And due to user feedback, we are investigating augmenting the data we track on each completed item. Please let us know your thoughts on anything contained in this post or really, anything else that is on your mind as it relates to Patchtrends.com. 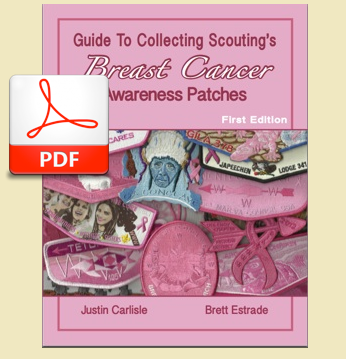 I am proud to announce that Justin Carlisle and I have recently released the Guide To Collecting Scouting's Breast Cancer Awareness Patches for sale in electronic format (PDF) for only $10. For 1 full year after purchase, you will be able to download the latest version of the guide. If you are not happy with the guide, we will work with you to resolve your issues. If we can't then we will happy to give you your money back. Why No Print Version Yet? We are currently working hard to find the best solution to provide a high quality printed version. Our plan to provide the guide in electronic format was made based on considerations of time to market , cost of the guide, and make sure we provided the best quality/price. Guide Authors, Patchtrends.com Wants to Work with You! This Guide represents the culmination of a lot of hard work by Justin and myself. In addition to the Guide you see before you, Patchtrends.com has worked very hard to position itself as a leader in providing specialized collection topic guides. While this Guide is the first one created with the help of Patchtrends.com, it is just the beginning. What can Patchtrends.com offer Guide Authors? Plus lots of other things that I haven't even though of yet!! Not guide author has the same vision or needs, so I'll work with you to create the guide that you have envisioned for yourself. No idea is too big or too small, so please contact me today for a free consultation. PATCHTRENDS@GMAIL.COM. The rules are simple - no trade (buying/selling only), and obey the Scout Oath & Law. I would love to have all of you on there. Hard at work improving Patchbazaar.com! The site now has non-store auction items listed as well. I have redone the user interface. I have also made it so when you first click an item, it shows an info screen and "related" Patchtrends data on the item. I am still tweaking the way I match an item with PT data, but it is usually pretty good. I have teamed up with a well known individual in the community to put together a guide on a very popular topic. As the publishing date gets closer, we'll make more announcements about it. I have a lot to say on the topic of guide creation, and if you're interested in doing one, please let me know. It has been my goal to be more than an online price database. I want Patchtrends.com to be a comprehensive publishing platform for guide authors and researchers to use in their quest to create and update their excellent publications. With this upcoming guide, it is a first great step in this direction, and I am truly excited about it. If you have a topic for which you'd like to create a guide and don't know where to start, let me know! I have plans to update the Patchtrends.com user interface. I also plan on interfacing with Patchbazaar to create an alerts system. That is, members set up alerts and when items matching their searches appear, they will be alerted. I also plan on automatically finding and recommending underpriced items based on Patchtrends data and current price of live auction items. It should provide a huge value to most PT members. I am still giving away free accounts to Scouts that meet some basic requirements. If you know one interested, please let me know. Never overpay. Never undersell, Know its worth. Join today! Updates, Hopes, and Dreams for the New Year! So far the New Year has been good. I have not posted in a while, but I've just been busy continuing to improve the site's ability to collect and store data for a very long time. Patchtrends.com as a service began operations in January of 2013, so we've been up and running for a year now. In that time, we collected over 1.4 MILLION records and have succeeded in becoming a very popular service. Because of the maintenance and overhead involved in the service, we have decided to raise the base subscription rate to $17/year for all NEW subscriptions. I can't stress enough the fact that once a subscription is bought and paid for, it will never go up. Only new subscriptions will increase. This is important because I plan on increasing the price for new subscriptions each year for the foreseeable future. The price increase will only ever apply to new subscriptions. The RaF program is still in place and has encourage a fair number of sign ups. 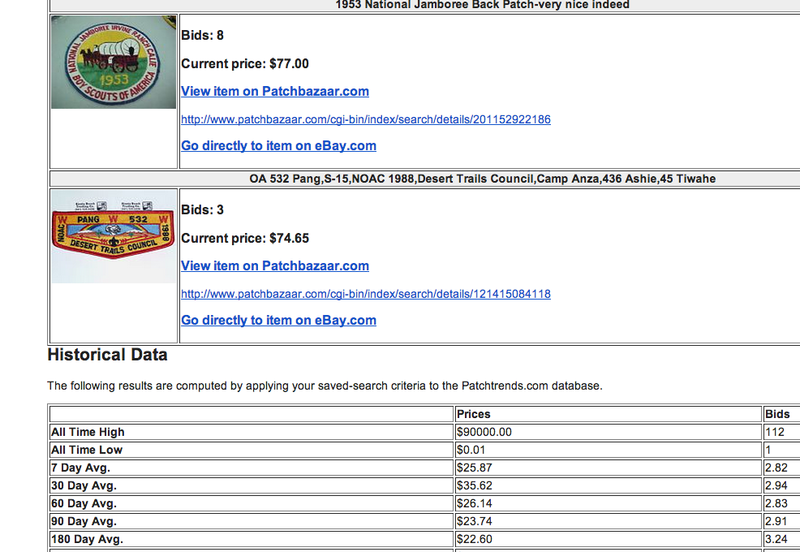 Patchtrends.com is a useful and valuable service, and should be appropriate for anyone buying and selling on eBay - even the casual buyer or seller. Late last year, I launched a service for tracking the prices of Virtual and Crypto-Currencies on eBay. The project is called Crypto-bazaar.net. Check it out if you want to find the best prices on virtual currencies. Thank you, and please remember to spread the word about Patchtrends.com!